Hi everyone, today I'm sharing a Dusty Attic DT layout of my Daughter Mackenna. 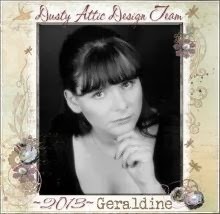 As the year comes to a close ~ so does my year on the DT with Fabulous Dusty Attic although I will continue to use their amazing products on my pages and projects. SSHhhh.......I will have some new 2014 DT news announced soon though! I hope you all had a wonderful Christmas and Best wishes for the New Year! I really enjoyed playing with Lindy's Stamp Gang Mist -Treasure Island Turquoise and Prima Woodgrain Stencil on the Background. Thanks for dropping by my blog and here's to a busy and creative 2014. Cheers G! Wow! Lové your work! The depth and the colors chosen are stunning...such great inspiration for me. Thank you for sharing.